Andrew Nicholson and Avebury at Rolex. Photo by Kasey Mueller. Prominent vet Hugh Suffern and renowned racehorse trainer Charlie Longsdon joined Andrew Nicholson to share their insight on the topic of fittening the event horse today at the International Eventing Forum at Hartpury College in Gloucestershire. Read on for their thoughts, which are grouped under a brief explanation of their background (though Nicholson hardly needs an introduction!). 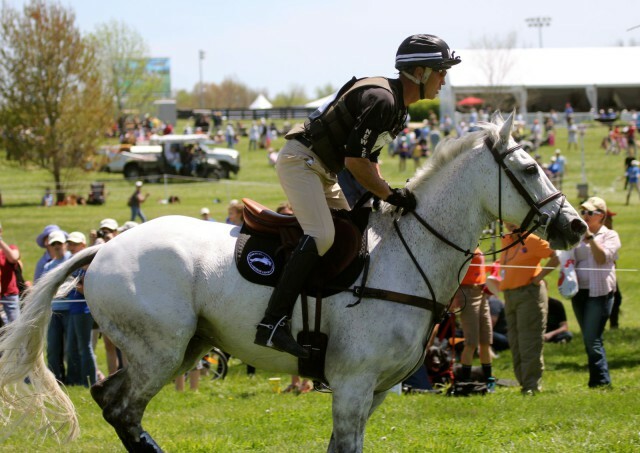 His keen interest in equine sports medicine and his own experiences as a competitor at the four-star level eventing were the perfect grounding for looking after equine athletes. He has been an FEI vet for over 20 years and the Irish team vet for 13 years, though three Olympic Games, three Worlds and six European Championships. Hugh is also the race course vet at Down Royal and Downpatrick, a committee member of The Association of Irish Racecourse Veterinary Surgeons, sits on the Tattersalls Ireland and Cavan Sales Veterinary Panels, Goffs Sales Wind Referee Panel, Goresbridge “Go for Gold” sale Radiography Panel and Irish Horse Board Stallion Inspection Veterinary Panel. He is a member of the Irish Thoroughbred Breeders Association Veterinary Committee. High is also a National Hunt stud owner, breeding Cheltenham winner and multiple Grade 1 performer Dorans Pride, Harcon and Premier Victory among others. He also stood national hunt stallions Zaffaran and Insan and currently stands the Irish Derby winner Winged Love. “The short format has brought changes. There used to be two main events each year and a long focussed fitness programme towards these events followed by a rest. Now there are more events with horses kept at a level of fitness. This requires special skills. Charlie has already packed a tremendous range of experience into his short career, including spells with Oliver Sherwood, Nigel Twiston-Davies, Kim Bailey, Nicky Henderson and, in the U.S., Todd Pletcher. Notable horses under his care with Nicky included Bacchanal, Marlborough, Trabolgan and Fondmort, and in the U.S., Ashado and Speightstown (one of whose Group 1 winning sons, Lord Shanakill, was trained by Karl Burke). Charlie has made a considerable investment in ultra-modern facilities at his stable in Oxfordshire, which he said has paid off. Brand new stables, 5 furlong woodchip gallop, 1 mile 2 furlong grass gallop, huge outdoor school for basic ground work and loose schooling, new horse walkers and turnout paddocks located in 450 acres of grass and arable land all contribute to strong, healthy, relaxed horses.